You know when you’re pregnant with your first child? Once the joy of finding out there’s a new life growing inside you, the horrible realisation dawns that you need to go through childbirth in order to meet him or her? Well, last weekend I went to Wembley and back in a day and it felt kind of like that. The happiness at getting there followed by the horror of realising you have to get back afterwards. I lived in Wales for a while and I will forever associate the place with the smell of Lynx Africa. In my whole life, I have only ever smelled one thing worse than Lynx Africa and that was when I accidentally poured a jug of urine (long story) into an iron and hit the ‘steam’ button with a vengeance. 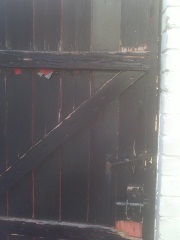 door to my house has rotted and is about to fall into a million splinters. The post that used to go across the top crashed down weeks ago and almost killed me while I was putting the purple bin out. So now I have to get a new back door.